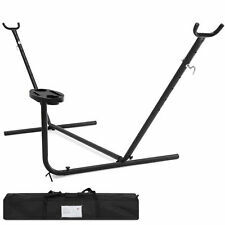 Best Choice Products 9ft Portable Steel Hammock Stand w/ Carrying Case - Black. Swing into relaxation on a hammock stand that brings unparalleled support and comfort wherever you travel. This hammock stand is made of weather-resistant powder-coated steel for durability. Best Choice Products 12ft Outdoor Heavy Duty Cotton Rope Double Hammock Set w/ Stand, Pad, Pillow - Multicolor Brown. Sink into relaxation with this colorful Chevron-styled hammock. Made of heavy-duty cotton rope with a weather-resistant steel stand, this hammock set is sure to be a backyard mainstay for many years. Best Choice Products 10ft Portable Steel Hammock Stand w/ Cup Holder Accessory Tray and Carrying Case for Travel. Swing into relaxation on a hammock stand that brings unparalleled support and comfort wherever you travel. A decorative grid pattern on the pillow and pouch help to add an inviting feel to your patio or lawn. BCP SKU: SKY1932. Best Choice Products Outdoor Patio Hammockw/ Stand, Pillow, Storage Pockets - Green/Black. Best Choice Products Quilted Double Hammock w/ Detachable Pillow, Spreader Bar - Orange and Green Stripes. Snuggle up with a loved one or a beloved pet, or enjoy a good book with a soft, outdoor breeze. 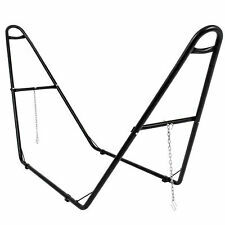 Best Choice Products Adjustable Universal Steel Hammock Stand for Hammocks 9-14ft Long - Black. Adjustable to fit hammocks 9.5 to 14 feet long. BCP SKU: SKY3407. This versatile stand has an adjustable design that fits all hammock types ranging from 9.5 to 14 feet long. Includes: Hammock, Hammock stand, Nylon carrying bag. Equip any outdoor living space with a new way to relax. Designed for complete outdoor comfort, this double hammock includes a sturdy steel stand with a built-in accessory tray. These hammocks feature a quilted cotton fabric that is dyetreated for UV resistance ,solid wood spreader bar, and a design that is sure to accentuate your backyard with tasteful color combinations. These are high quality hammocks thatwill last for years. Theblue and green stripe design is sure to accentuate your backyard with its unique and tasteful color combination. There isno assembly required, so it is ready to be used right out of the box. So, now you can take your hammock anywhere you'd like. Whenever you feel like lounging around in your backyard or patio, our cotton rope hammock is the best accessory for your needs. The rope hammock is made of 900 feet of twisted heavy duty cotton rope. Made of 100% cotton, this hammock is designed to keep you relaxed and comfortable in any outdoor space. It is able to accommodate two adults (up to 450 lbs.). For convenience and durability, it includes a stand that is constructed of sturdy and all weather-resin steel. Swing into relaxation on a hammock stand that brings unparalleled support and comfort wherever you travel. 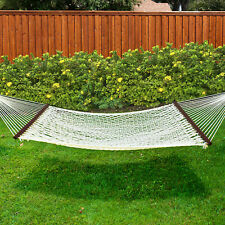 This hammock stand is made of weather-resistant powder-coated steel for durability. Hammock not included. Enhance any outdoor space with a total comfort solution. With a sturdy steel stand and included carrying case, leisure can happen anywhere from the beach to the park. 2-PERSON RELAXATION: Double hammock is spacious enough to provide a comfy place to rest and catch up with a loved one or a furry friend. There’s nothing better than relaxing to the rhythm of a swaying hammock in your own backyard. The quilted fabric hammock will accentuate any backyard or outdoor area. It features heavy duty cotton fabric that is dye-treated for UV resistance and solid wood spreader bar. This hammock stand is made of weather-resistant powder-coated steel for durability. Lounge with ease using this hammock stand. It works with hammocks of various sizes, both with and without spreader bars. Hammock stand. Includes 2 heavy gauge hanging hooks that easily adjust to accommodate different hammocks, with or without spreader bars. PORTABLE: Take comfort and relaxation on the go with the included carrying case for even more portability. WEATHER-RESISTANT DURABILITY: Made for outdoor or indoor use, this hammock stand is crafted of weather-resistant, heavy-duty, powder-coated steel for long-lasting, durable comfort. Outdoor Hammock Sleeping Mattress Pad Pillow Top with Stand Suspension Ring 12 Make sure this fits by entering your model number.Hammock Size:: 52"W x 144"L x 45"H 12 foot overall length Hammock bed size: 52"W x 76"L12' Stand constructed of sturdy all weather-resin steelSturdy suspension ringsIncluded free pillow and pillow pad for extra comfortNo tools required for assembly Best Choice Products Cotton Rope Hammock amp 12 Feet Steel Stand Combo w/ Stripe Pad and Pillow Color:Multicolor Brown. Best Choice Products Outdoor Double Hammock Set w/Steel Stand, Cup Holder, Tray, and Carrying Bag - Desert Stripe. Equip any outdoor living space with a new way to relax. Designed for complete outdoor comfort, this double hammock includes a sturdy steel stand with a built-in accessory tray. Enhance any outdoor space with a total comfort solution. With a sturdy steel stand and included carrying case, leisure can happen anywhere from the beach to the park. Best Choice Products Portable 2-Person Double Hammock Set for Indoor, Outdoor w/Steel Stand, Carrying Storage Case - Red Stripes. Swing into relaxation on a hammock stand that brings unparalleled support and comfort wherever you travel. Relax with a good book, and then set it aside on the convenient accessory tray, perfect for storing everything from phones to magazines. Make your backyard or patio more relaxing, stylish and attractive with this Best Choice Products Double Hammock Set. It's designed for promoting a more relaxing and calm lifestyle in any outdoor place. Swing into relaxation on a hammock stand that brings unparalleled support and comfort wherever you travel. This hammock stand features weather-resistant powder-coated steel for a durable, sturdy construction. Lounge in style with a new incentive to go outdoors. A rust-resistant, powder-coated steel composition also ensures long-lasting use. Pair your hammock with this stand to complete the perfect hangout. Snuggle up with a loved one or a beloved pet, or enjoy a good book with a soft, outdoor breeze. Pairs perfectly with our Adjustable Hammock Stand for Hammocks 9-14ft Long (SKY3407). Thick, pillow-like cushioning. Adjustable to fit all hammock types ranging from 9.5 to 14 feet long. This versatile stand has an adjustable design that fits all hammock types ranging from 9.5 to 14 feet long. It's made to be used indoors or outdoors with a rust-resistant finish. These wheels allow you to move your hammock from the sun to the shade with ease so you can relax anywhere with little effort. These heavy duty wheels can be easily attached to the hammock stand. FEATURES: Moving hammocks has never been easier, Includes two nuts, two bolts, and steel clamp, Easy to assemble. Snuggle up with a loved one or a beloved pet, or enjoy a good book with a soft, outdoor breeze. Pairs perfectly with our Adjustable Hammock Stand for Hammocks 9-14ft Long (SKY3407). Hammock Material: Polyester. This versatile stand has an adjustable design that fits all hammock types ranging from 9.5 to 14 feet long. It's made to be used indoors or outdoors with a rust-resistant finish. Designed to be sturdy and balanced, this stand stays secure so you can focus on relaxing. Equip any outside living space with another approach to unwind. Equip any open air living space with another approach to unwind. Intended for complete outside solace, this twofold lounger incorporates a tough steel remain with an inherent extra plate. Lounge with ease using this hammock stand. It works with hammocks of various sizes, both with and without spreader bars. Includes: Hammock stand, (2) Hanging chains. 2 adjustable hanging hooks for different sized hammocks.